It’s odd Christmas seems to have started very early this year even before Thanksgiving and that surely is a record! Still I can’t complain because my wonderful supportive and amazingly cuddly readers both old and new are buying my books in their thousands and apart from saying “please don’t stop,” I would like to thank them so very much for helping to keep a genius of a Cat warm this Christmas and indeed some way into the New Year. Of course I would stress that you, dear cuddly readers shouldn’t stop buying my books and that if you can you should buy even more because I have a little plan that I would like to share with you. I plan to buy a Yacht! Well all sorts of successful people have Yachts and indeed a lot of people who are no longer very successful like poor old Stevie Spielberg who must be tearing his hair out wondering how to get a movie hit. Here is a bit of advice for Steve – if you want a movie hit don’t what ever you do chose a story that is old and tired and written by a Belgian, oops sorry too late – isn’t the Tintin movie a bit of a Dog? So what was I saying, oh yes I want to buy a Yacht, nothing too fancy just somewhere to entertain guests and special cuddly readers, sail the world and be very very comfortable – you do think I am worth it don’t you? Oops sorry for the l’Oréal moment! Oh I nearly forgot with all of the Xmas excitement here is a silly picture from somewhere where being daft is being normal – the human world -and in particular Kenya. Ladies and Gentlemen and all cuddly readers I give you a ‘Kenyan Suggestion Box!’ Isn’t it just the best suggestion box in the world and definitely deals appropriately with all of the idiot suggestions that you get in boxes of this sort. Lastly if you haven’t got the copies of my books that you intend to give as cherished Christmas presents this year there is still plenty of time if you shop at www.amazon.com or indeed www.amazon.co.uk. Just to help you there are some more specific links below, but before those I would like to draw your attention to a book written and illustrated by my translator John Woodcock. 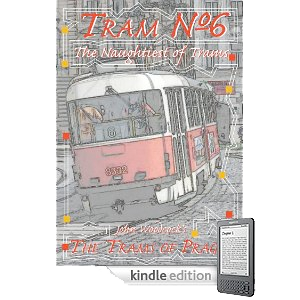 His book is called Trams of Prague Kindle edition and it has been enjoying a bit of success recently. Obviously the tome is not selling as well as Getting Out Excerpts from a Cat’s Diary or indeed my latest and greatest (to date) book The Cat’s Travelogue but it’s nice to see that the old boy has got what it takes to ‘make it’ on his own without my help, don’t you think? If he sells a lot of copies of his book Trams of Prague I think I’ll buy him a rowing boat so he can visit me on my Yacht! You dear cuddly readers can help and buy his book here Trams of Prague Kindle edition. I thought I would show you a picture of the cover he is really rather good at illustrating and that’s handy because Trams of Prague is what they call in the trade – heavily illustrated. If you need to save time and get whizzed straight to www.amazon.com to buy one or better still multiple copies of my books I have, being a kind and generous Cat, made it so very simple that even a human can do it. Just click one or all of the links below. Of course I could go on and add more specific links to the www.amazon.co.uk pages of my books but this blog page is getting a little cluttered with links don’t you think? And worse you might thing that I was just after your money, and I promise that simply isn’t true! As I said above I want a Yacht! Finally (honestly), do you get the impression from this blog that I rather like Christmas time and in particular Holly? Well if you do you would be right I really do because it is a great time to buy my books, so what are you waiting for?